Utah is home to 5 national parks that call to RV road-tripping outdoor enthusiasts. If you fall into this category, here’s what you need to know about camping at and near Utah’s Mighty 5. Zion National Park has 3 campgrounds: South, Watchman and Lava. The first 2 are in Zion Canyon, and the latter is roughly a 1-hour drive from Zion Canyon. Camping is popular here, especially from the middle of March through November, with most campgrounds full every night. You can park your RV at any of the 3 campsites, but there are some things to note before doing so. Lava is only open May through September, the campsites are primitive and vehicles 19 feet and longer aren’t allowed. South Campground is open February through November, is first-come, first-served but RV hookups aren’t available. Watchman is open year-round and has 63 RV electrical sites that charge $30/night. It’s the most popular RV campsite in Zions, so be sure to make a reservation ahead of time to ensure you get a spot. Each campsite is drive-up and only 1 RV or trailer is allowed per spot. There are 2 campgrounds inside Bryce Canyon: North and Sunset. North is open year-round, but Sunset is closed from mid-October through mid-April. Both campgrounds are encircled by Ponderosa Pine forest that provides equal amounts of sun and shade. Cost is $30/night, and there aren’t any hookups. But there is a dump station in the North Campground that charges a fee for using it. If you don’t want to stay in the park, you have a couple other nearby options. Bryce Canyon Pines RV Park & Campground offers pull-through RV sites that come with full hookups, a fire pit, picnic table as well as a swimming pool and hot tub. Ruby’s Inn RV Park & Campground, which is only one-half mile from the park’s entrance, offers full hookups and electric and water hookups amongst 250 campsites that have a large pull-through area. Other amenities include a dump station, propane, laundromat, internet and more. Cost varies per the number of people. Fruita Campground is the only developed campground inside Capitol Reef. It’s a beautiful green oasis within the deserts of Southern Utah, as it resides next to the Fremont River and is surrounded by orchards. There are 64 RV/tent sites, costing $20/night, but there aren’t any individual water, electrical or sewage hookups. But there is an RV dump and water fill station. Fruita Campground is open every day of the year, with the busy season running April through October, and sites are first-come, first-served. The nearest outside RV parks are in Torrey: Wonderland RV Park and Thousand Lakes RV Park. Wonderland has 75 ft. x 26 ft. pull-through sites and 60 ft. x 31 ft. backups, along with full hookups, 30/50 amp electrical service, free WiFi, laundry, shaded areas and more. Thousand Lakes has back-in sites and 65 ft. x 30 ft. wide pull-through sites. The back-in spots have water and electricity, while the pull-through spots are full hookups. They also have 20/30/50 amp service, free WiFi, RV supplies, a dump station, pool, amazing red rock views and more. Thousand Lakes charges daily, weekly and monthly rates, and senior citizens get a 10% discount. At the top of Arches National Park is Devils Garden Campground. It’s the only campground here that has a beautiful setting, with most of the campsites surrounded by huge rock formations and trees that provide some shade and protection from winds. There are 50 campsites; some of which have better mountain views than others, but they’re more exposed to weather elements. Group sites don’t allow RVs. There are also several RV campgrounds in Moab, which is only 5 miles from Arches. The Moab KOA Campground is a popular option with RV hookups, an 80-foot maximum length, 50 amp service and dog park. Another option is Moab Valley RV Resort & Campground, which offers pull-through, leveled gravel spots as well as back-in spaces, and has water, sewer and cable availability. Canyonlands has 2 developed campgrounds: Island in the Sky and The Needles. The first has 12 campsites and charges $15/night, and the second has 26 and charges $20/night. Both can accommodate RVs up to 28 feet long. Island in the Sky campsites are first-come, first-served, but The Needles has some that you can reserve. The busy season is March through June and then September through mid-October. There’s also Canyonlands RV Resort & Campground in Moab. You’ll find various RV accommodations that offer pull-through sites, cement pads, 50 amp and range from 25-45 feet deep. Water, sewer, electric and cable are also available. 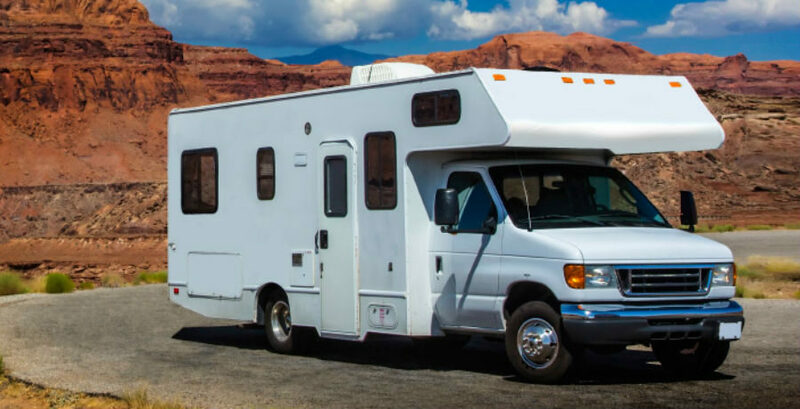 If you’ve recently been approved for an RV loan and are ready to hit the road in your travel home on wheels for Utah’s national parks, here’s what you need to do to enjoy your RV camping experience. Review the national park websites. Read through the ‘Things to Know Before You Come’ and ‘Plan Your Visit’ sections. Each site will tell you about driving conditions, weather and other park and campground information. Limit generator use. Some first-time RV owners rely on generators to power everything inside their RV. Most national parks allow generator use but only let you use them during certain hours. Plus, camping etiquette means being a good, quiet neighbor, and the constant drone of generators isn’t quiet, so limit your generator use to the necessities. Know everything about your RV. Some campsites don’t fit every RV so know the size of yours. Some also don’t offer full hookups, so know how much power your appliances use, how much your waste tanks can hold, etc., so you don’t have any surprises during your trip.